Bill Graham of the Internet Society has won an election to ICANN’s board of directors. Graham beat academic Avri Doria by 8 votes to 5 in the second round of polling from the Non-Contracted Parties House of the GNSO Council. He will take his seat at the end of ICANN’s meeting in Singapore next month, June 24, replacing trademark lawyer Rita Rodin Johnson, who is reaching the end of her term. Graham currently leads ISOC’s “strategic global engagement” initiatives. (UPDATE: Thanks to Graham for alerting us to the fact that he actually retired from ISOC a week ago). Until 2007, he was director of international telecommunications policy with Industry Canada, the Canadian government’s department responsible for the technology economy. In that role, he also served as vice-chair of ICANN’s Governmental Advisory Committee. The current GAC chair, who also has a non-voting seat on the ICANN board, is Heather Dryden, also a senior policy adviser at Industry Canada. Graham will become the fourth former GAC member to join the ICANN board, after former CEO Paul Twomey of Australia and current directors Bertrand de la Chapelle of France and Gonzalo Navarro of Chile. 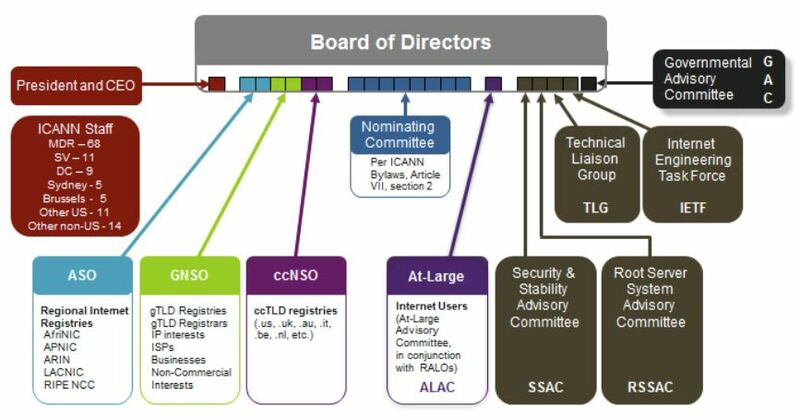 Here’s a useful infographic, courtesy of ICANN, that shows how the board is composed (click to enlarge). The two green squares are set aside for members of the GNSO. One is for “contracted parties” such as registrars and registries. Graham, elected by the NCPH, will take the other. In the first round of voting, which concluded a week ago, Doria led by 7 votes to 6, one short of the 8 votes needed to win. While the voting was private, it is believed that non-commercial and commercial stakeholders voted in blocs in the first round – commercial for Graham, non-commercial for Doria. In the second round, two of her supporters evidently switched sides. Graham and Doria were the only candidates to be nominated. In congratulating Bill Graham on his victory, I only hope that the members of the Non Commercial Stakeholder Group who gave him their vote were able to convince him to show some interest in the issues of concern to the non-commercial stakeholders. As far as I can tell, he never approached the NCSG membership during his campaign. So I am not sure he knows what it is we care about. But perhaps the two voters from the NCSG told him and got his promise to care. I hope so. So I wish Bill well, and hope that he does not end up a Board member who serves only government and business interests. A quick correction to the information above and a comment: I have retired from my position with the Internet Society, effective a week ago, although I expect to continue part-time work as a contractor with them. I’m honored to be chosen by the Non-Contracted Parties, and am committed to working with both sides of the house during my term. Thanks to all who supported me. Thanks Bill. I’ve updated the piece accordingly.